Options 1 and 2 are quick and dirty solutions. People that really need to improve the power input right now can implement one of this 2 methods quite easily. Option 3 has more “contras” than “pros”, IMHO. I’m not sure what the best solution is, but I agree that the micro USB connector is a poor choice for powering Zynthian. I’ve managed to break off the micro USB from a couple of RPi boards in the past & it’s impossible to solder them back on again. A dream solution would be to have a USB B ("Printer connector) on the back of Zynthian. Then we can use a thicker USB A-B cable connect to a 5V PSU. These cables have much bigger cores so the voltage drops are much less than with the spindly micro USB cables. I had lots of problems during booting until I used a better USB charger (2.4 A rated) and a real USB charger cable (2 A rated). my disco-Zynthian ahs a 5A power supply - but currently with a micro-SD adapter. Will fix this as soon as I have time (and have a free Raspi3 for exchanhing the current Raspi2). FWIW, on another project I’m building (MidiBox Seq V4), I had the same concerns about using microUSB as the main power input. 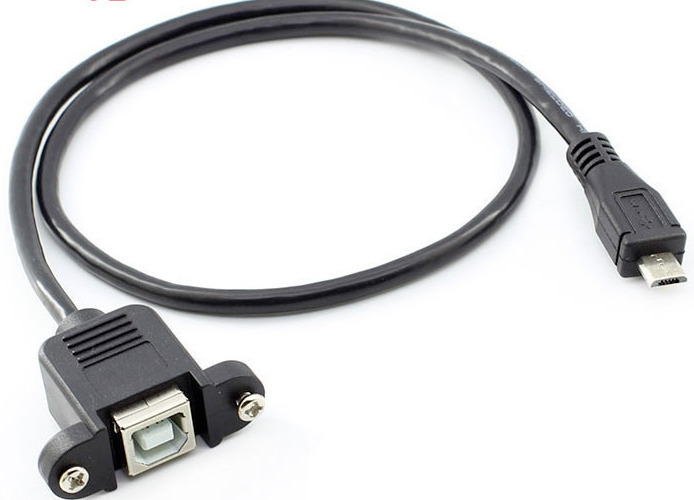 High quality USB 2.0 B panel mount female to USB micro B 5pin male Cable. Cable length about: 50cm. Color: Black. | eBay! Not so easy with the Zynthian because the USB needs to be flush with the case in order to access the other connectors. I do agree that the only place that micro usb should be used is when there isn’t space for a B connector. Aha! I found myself looking for the same cable, since I’m gathering the parts to make another, bigger Zynthian. 50cm is still a bit too long. 20cm would be idea. 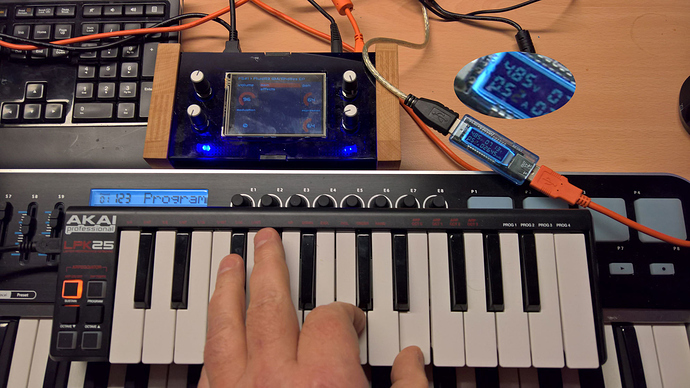 And by the way, RPi3, Hifiberry DAC+, midi keyboard, ttl midi out, extra leds, touchscreen etc… and never more than 0.6A current draw, even under heavy load. How did you get that measured ? How many times have you repeated the powerup ? I use an inline USB meter/tester (link) which is measuring for some days now, so Zynthian had several startups and uses. I would recommend not using any type of USB connector to power the device if you want to move it around, e.g. take to gigs. Even the USB Type B is prone to failure. It is easily dislodged and I have a QX49 that has a faulty socket. (The central plastic locator can become unconnected and push back within the socket.) I would recommend using a standard (as if there is such a thing!) power connector proven in use over many years, e.g. concentric connectors used by Roland et al. (Better still - a locking connector.) Then have an internal power regulator (which could integrate with a rechargeable battery like jofemondo suggested which provides portability plus UPS). (I don’t personally like these connectors but they are still working on my 40 year old musical devices!!!) Or go a stage further and add an internal power supplier with IEC 60320 power inlet to get rid of the wall-wart all together. The further we get away from the micro USB the better (but probably also more complex and expensive). Regarding power switch - adding a simple, press to make switch between pins 5 & 6 allows a powered but shutdown RPi to be booted. I have this on my Zynth and it works well. Because you don’t generally press it during normal operation it does not interfere with the I2C clock. (I2C recovers fine if you do press the button - it just won’t work whilst the button is pressed.) I haven’t bothered with implementing power off for this button because we have the option to long press the Select knob. I would recommend adding this power-on button to the core design. The hifi berry amp cards provide a much more reliable approach but sadly only include a 2Amp regulator on board. Something similar but considerably more meaty would be of great benefit. I am using an internal Meanwell. Appliance coupler with switch to the outside.